Set in 1920s Norway. Also, outer space. I learn from NeoGAF of a handsome adventure game named Milkmaid of the Milky Way, and whadda ya know, that adventure game released on Steam a few days ago. Sporting lovely pixel art, a novel premise, and a rhyming script, Milkmaid is an old-fashioned point-and-click made in Norway, and partly set in Norway, that also takes its daydreaming heroine into outer space. 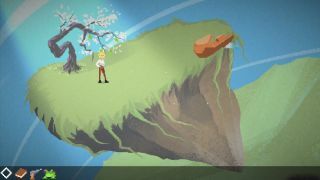 "Milkmaid of the Milky Way is a classic puzzle adventure game where you play Ruth, a young woman living alone on a remote farm in a faraway fjord in 1920's Norway. Life is hard, work is tough, and Ruth wonders; Is this the life I want? Then one day a huge spaceship arrives, turning her world upside-down."